Please Note: You can find much more information about this and other Futuro Houses by going to "The Futuro House Project" our ongoing project to document all things Futuro. ... earth somewhere as your attention is drawn by the "UFO House". 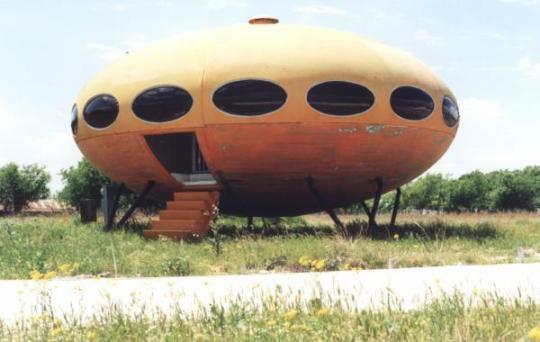 Located in Royse City about 12 miles or so east of Rockwall, Texas the "UFO House" is actually one of many "Futuro" homes from the 1960's and 1970's. Designed by Finnish architect Suuronen initially as a ski cabin it ended up being a prefabricated and easy to transport home which could be mass produced and transported anywhere. 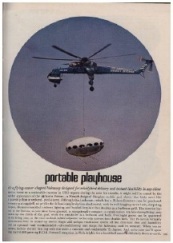 A Futuro home could be assembled / disassembled on site in a couple of days or, for the more adventurous [and probably wealthy], it could be airlifted in one piece. Produced during the late 1960's and early 1970's the Futuro then fell foul of the mid 1970's oil crisis. Being made of primarily of plastic the three fold increase in oil prices effectively destroyed the homes financial viability and production ceased. Estimates of how many "UFO Houses" were manufactured and sold vary, a Google Search will show that, as do estimates for how many remain. The general consensus appears to be that some 100 were produced of which some 25 to 50 are likely surviving. The archINFORM database lists the locations of 30 of the units. The Futoro house was the subject of a 1998 Finnish documentary; information about the film can be found here. 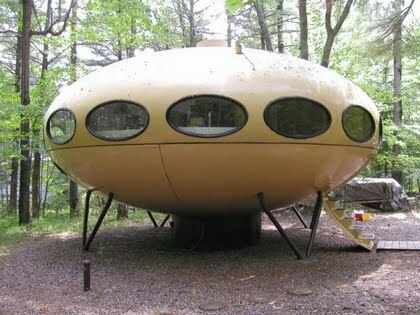 The Futuro House also was the subject of a 2010 thesis submission to The Metropolia University of Applied Sciences in Finland (available online here) by Anna-Maija Kuitunen. The thesis contains a wealth of information about the Futuro House including history, diagrams, images and construction methods. The one on South Munson in Royse City is of particular interest to us as it is relatively close to home and we plan on replacing the photo below with one of our own in the not too distant future. We were also somewhat amused by the one in Pensacola Beach, Florida which happily found itself a home on top of another house. 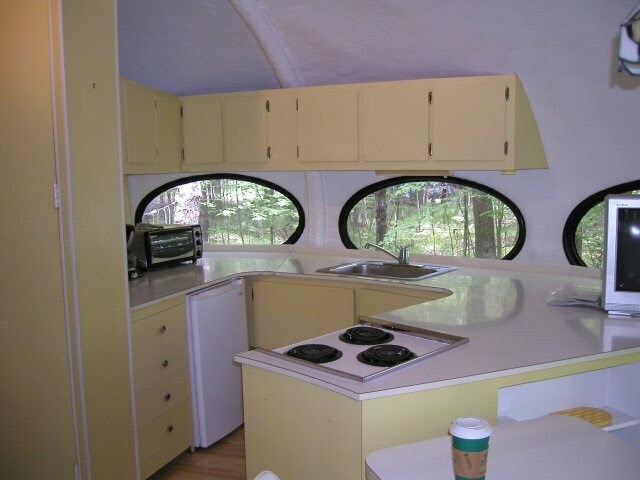 There is also one situated on Sumach Lake in Arbor Vitae, Wisconsin, about 2 miles from Minocqua and, should you feel like a space adventure, this one is actually for rent. Check it out here. 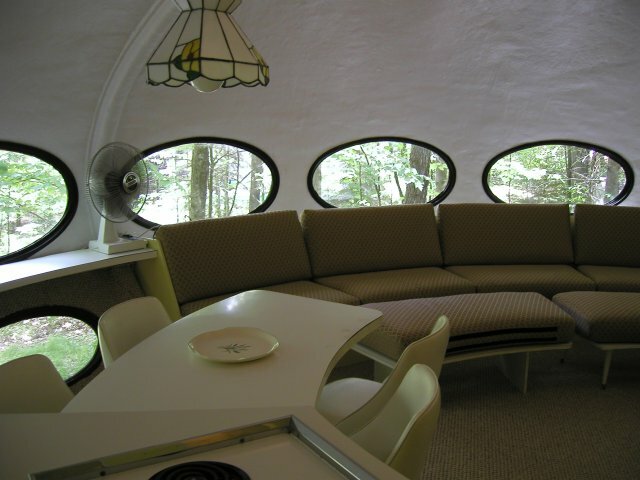 We plan on researching and adding more of the Futuro houses in the future after we have researched and published the large database of sites we already have plans for so subscribe to our feeds and you will automatically be alerted when there are updates. Based solely on the fact that it's located in Texas, I believe the Royse City unit is the same one that enjoyed a brief but happy life as a trendy clothing and style shop in Houston during the mid '70's. It was located in a popular shopping area just north of Hwy 59 on Kirby near River Oaks. It was moved (to where I don't know) and replaced by a free-standing Steak 'n Shake which in turn was replaced by a 12(? )-story office building in the mid '80's. Really interesting bit of history - thanks so much for sharing it with me. It looks really bad now, the windows are all broken out, weeds are head high, don't think there is anything inside. Almost became airborn back in April when a tornado came real close to it when it hit Royse City in 2012. It's sad that no one didn't actually took the time to take care of it. It's a very precious piece of history that just floated away. I would loved to see it in it's former glory. I love that house. Yes, it is in really bad shape but still has good bones. I heard a rumor awhile back that they owner wanted to sell it. If only I could win the lottery I would buy it and restore it. It would make a great parent get away room. 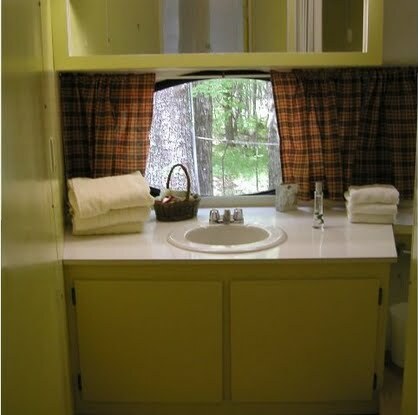 Someone told me that the windows would have to be custom made which would be very expensive. I grew up going past this when I was a kid on the way to my grandmother's in Rains County from Dallas, I remember it as the picture above and have seen it since. Always wondered about the history of this building, as it it intrigued me my entire life. the windows would not be that bad to replace if someone vacformed them from lexan. just a thought. I would love to get a hold of one of these myself. Would also like to know who owns it as I heard they've been repainting it and doing some yard work lately. Some idiot put a geocache inside of it and the geocaching association refuses to acknowledge it's someone's property or house until the owners contact them at let them know. Until then, they are welcoming people to crawl around and add to it's destruction. If anyone knows, can they contact Groundspeak.com and tell them to contact the cache owner about his trespassing? or even the local authorities? I live about 15 minutes from there, we build fiberglass domes and architectural parts. It would not be hard to duplicate. But I would propose making it out of GFRC (fibermesh coated concrete) as it does not burn. I large plastic or fiberglass house is quite the fire hazard. It would probably come out cheaper in GFRC, more green, all around better except weight, a bit heavy to transport, might have to make it on site. Cody, how much would it cost to duplicate one of these in GFRC? 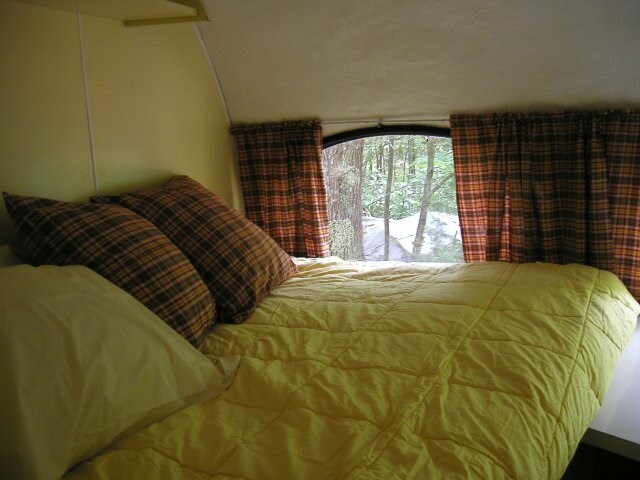 Would love to have one as a space, cabin getaway. My fiend and I were just there taking pictures of it. The door is off the hinges and laying inside the house. You can see where someone had it plumbed out at one time. Lots of big spiders lurking about, but it's a really cool place. Not too much really, GFRC is rather inexpensive. Going to see if I can do a 3D scan of it with our new gadgets and duplicate it. Unfortunately, I live across the street from it. Yes the tornado left it along but my house was a direct hit. From time to time the owner will put a fresh coat of paint on it. Since I have lived across from it, it has been touched up twice. New paint, Door attached back to the hinges, replaced windows once. A few weeks ago there was a group of about 10 people taking pictures of it. We live close by as well. Anyway you could help us locate the owner? I work with a collective design group that is willing to donate time towards restoration. 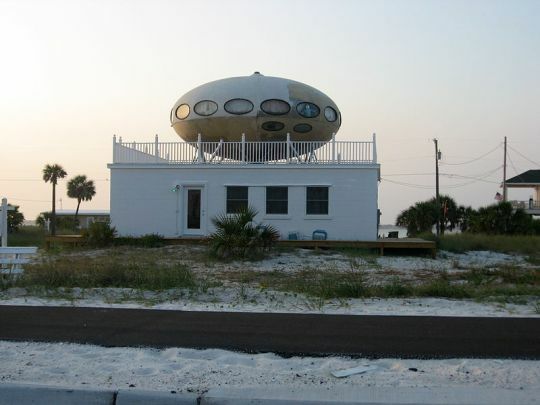 I found the "other" UFO house and it's in Texas. Stumbled upon it accidentally while on vacation.